What a day from Paris! The short programs featured great all-around competition, and going into Saturday’s free skates, Team USA is in medal contention in all three disciplines in which it is represented. NBC will air coverage of the event from 4:30-6 p.m. (ET) on Sunday, Nov. 17, with additional broadcast coverage available on Universal Sports Network and throughout the weekend. Icenetwork Season Pass subscribers will have access to live video from Trophee Bompard. To become a registered user or a Season Pass subscriber, please visit www.icenetwork.com. Event coverage, including results, news, recaps and photos, will be available on icenetwork to all users. Ashey Wagner, who began her season with a second-place finish at 2013 Hilton HHonors Skate America, leads after the short program. She takes a six-point cushion into the free skate over Russia’s Anna Pogorilaya and Adelina Sotnikova, who are virtually tied at 60.03 and 60.01, respectively. En route to 66.75 points, Wagner’s “Shine On You Crazy Diamond” program featured a trio of Level 4 spins and Level 4 footwork, while she added two jumps, a triple loop and a double Axel, in the second half of the performance. Christina Gao and Samantha Cesario sit in fourth and fifth, respectively, and certainly in medal contention. Gao totaled 58.81 points and Cesario earned 56.55. Friday started off strong as Caydee Denney and John Coughlin, the 2012 U.S. pairs champions, registered their best short program score of the season at 63.52 points. They are in fourth place, but less than four points out of first. The “Tosca” program featured seven elements that received positive GOEs, including side-by-side triple toes and a level 4 lift and pairs spin. China’s Qing Pang and Jian Tong, who have skated together internationally since 1997, hold the lead with 67.69 points. They are followed closely by Canada’s Meagan Duhamel and Eric Radford, Russia’s Vera Bazarova and Yuri Larionov and Denney and Coughlin. The top four men after the short program, Patrick Chan of Canada, Japan’s Yuzuru Hanyu, our own Jason Brown and China’s Han Yan, came to compete on Friday. Chan registered a personal best short program score with 98.52 points. Hanyu’s technical mark of 52.72 (overall 95.37) was the highest of the event. Brown, skating to “The Question of U” by Prince put out a perfectly clean performance. 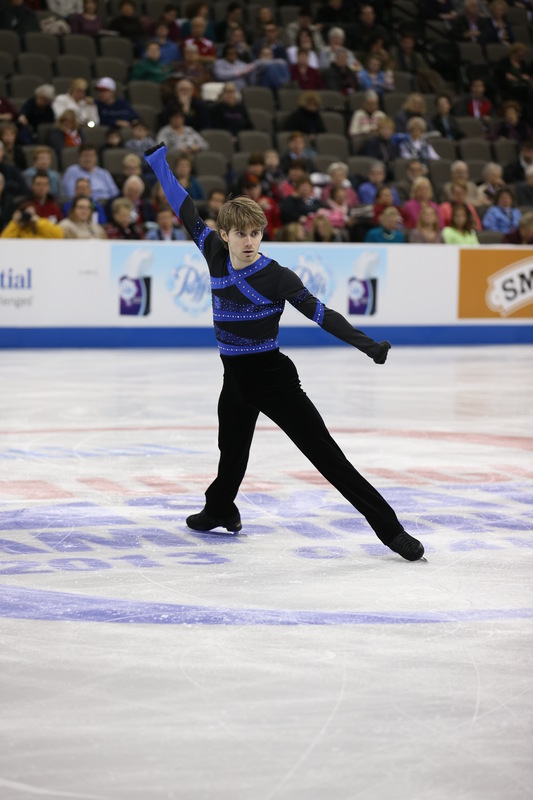 Six of the program’s seven elements earned a GOE of over 1.00 and his four non-jump elements (three spins and a step sequence) were all Level 4. His total score of 84.77 represented a personal best. Han, who won Cup of China by a landslide, narrowly trails Brown at 84.34 points. Canada’s Tessa Virtue and Scott Moir, the reigning Olympic champs, lead the dance event with 75.31 points. They are followed by Nathalie Pechalat and Fabian Bourzat of France and Russia’s Elena Ilinykh and Nikita Katsalapov. Every month we will unveil the new cover for the upcoming issue of SKATING magazine. Here is the cover for the January issue featuring all of the reigning U.S. champions. * There appears to be a reddish tint to this photo that does not occur in the actual copy.